British actor Daniel Craig has quit courtroom drama The Whole Truth, days before he was due to begin shooting in Boston with co-star Renee Zellweger. Craig was set to play a district attorney and had been spotted preparing for the role at Boston's Suffolk County Superior Court last month. Producers have halted production on the film, according to the Boston Globe. According to the Hollywood Reporter, the start date has been moved back by three weeks. Directed by Frozen River's Courtney Hunt, the film was scheduled to being filming on 14 April. It is thought Craig left the project on Sunday. The film would have seen Craig appear alongside Zellweger and 19-year-old Gabriel Basso, previously seen as Laura Linney's son in TV series The Big C.
The independent project was announced during the Berlin Film Festival in February. Craig will soon reprise his role as 007 in the 24th James Bond film, due out next year. 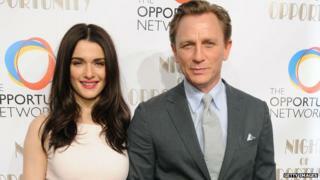 The 46-year-old and his wife Rachel Weisz - who recently co-starred on stage in a Broadway revival of Harold Pinter's play Betrayal - were seen together on Monday at a charity gala in New York. The event was organised by the Opportunity Network, a charity supported by the couple which helps high-achieving, low-income students gain entry to top colleges.